When discussing Airbus' forthcoming A380 airplane, Continental Airlines CEO Gordon Bethune is fond of asking, "What's in it for me to check in with 550 other people, sit on an airplane with 550 other people and wait for my bags with 550 other people?" The answer is "not much" unless you believe in exciting social and recreational opportunities touted to be availablebowling, anyone?to you and more than 500 fellow seatmates. Indeed, versions of the A380 are estimated to carry as many as 800 souls in a single-class configuration, sitting, waiting and checking in on the same airplane. This scenario represents the fundamental philosophical divide between Boeing and the European consortium Airbus, with each betting on a different vision of commercial airline travel. Airbus touts the A380 as the supersized solution to relieving airport congestion and economically ferrying more passengers between major hubs. Boeing has a decidedly different vision. Boeing believes passengers ultimately steer airline strategies, and that passengers want safe, reliable service with the shortest trip timesnonstop flights with more departure choices, low fares and comfortable surroundings. Nicole Piasecki, vice president, Business Strategies and Marketing for Commercial Airplanes, also noted passengers prefer the convenience of frequent departures and don't want to travel on circuitous routings through one or two connecting hubs. "More frequencies and point-to-point services: these two market conditions are what we call 'fragmentation,' and data shows passengers prefer it," Piasecki said. In other words, the market demands more new and more frequent nonstop flights, not increased airplane capacity or double-decker flight decks. "Growth in air travel over the past 15 years has been met entirely by an increase in new nonstop markets and by frequency growthnot by an increase in average airplane size. This is the fundamental essence of Boeing Commercial Airplanes' product strategy," Piasecki said. During this time, freer market access has intensified competition while a broader selection of airplane modelswith more capacity and more rangehas emerged to meet competitive market demands and challenge traditional paradigms of air travel. If an airline wants to compete against an A380, it can effectively do so only with smaller, more capable aircraft that allow more convenient departures and nonstop routing, said Piasecki. Extensive Boeing research reveals air travel growth has been met by an increase in new nonstop markets, or airport pairsnot by an increase in aiplane size. Average airplane size, in fact, has remained constant with a slight decline since the early 1990s, noted Randy Baseler, BCA vice president of Marketing. Despite dips in air travel in 2001 and 2002, Baseler said, Boeing expects air travel growth "to return to the long-term trend with the same emphasis on increased nonstops and frequency to meet traveler demands." As an example, U.S. domestic airlines historically brought transoceanic travelers from the U.S. interior to gateway airports such as New York's John F. Kennedy International Airport and Los Angeles International. 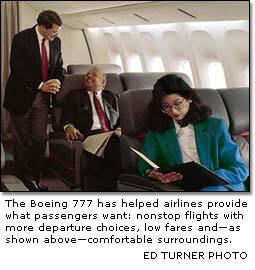 From there, travelers flew to overseas locales on low-seat-mile-cost 747s operated by carriers such as Pan Am and TWA. With deregulation, airlines previously limited to domestic flights began to offer more scheduled choices to international destinations by using smaller 767s, and later 777s, from their U.S. hubs. "Naturally, air travelers chose to fly these nonstop flights to Europe rather than the more indirect connecting flights with Pan Am's or TWA's Europe-bound New York flights," Baseler said. By 2001, United and American Airlines alone were operating 22 daily nonstop flights from their Chicago hubs to 12 European destinations using a mix of 767s and 777s. Some 73 percent of U.S. airline flights on North Atlantic routes were 767s and 777s. A significant share of these services was from U.S. carrier domestic hubs. "For this reason, the 767 has been credited with the fragmentation of the North Atlantic market," Baseler said. And failure to adapt to the new market had its consequences. For example, Pan Am chose to maintain the strategy of low seat-mile cost by using the 747 to connect passengers through gateways like New York. Air travel growth bypassed the gateways in favor of increased flight frequencies and nonstopsand caused the rapid demise of airlines that failed to adapt to the new competitive marketplace. This scenario has been played out in other markets. Take the North Pacific, with long routes such as New York to Hong Kong. Regulation liberalization and the 777 are fragmenting service, just as the 767 did over the North Atlantic in the mid '80s. A quick look at how the 777-200ER (extended range) has been used in the North Pacific provides ample evidence of how today's long-range twinjets are reshaping air travel and airline competitive strategies by allowing nonstop flights. Even with a slow economy and the aftermath of the Sept. 11, 2001, terrorist attacks, service continues growing on Pacific routes. 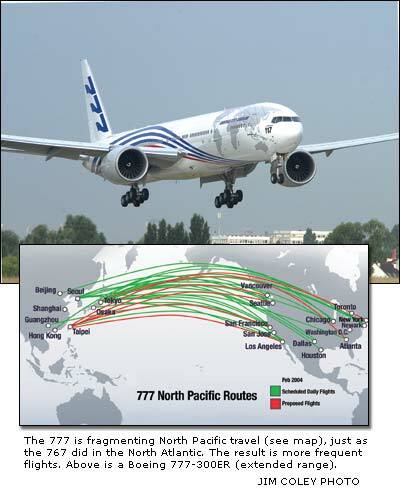 As of February 2004, five Asian airlines and four U.S. carriers operate an average of 55 daily flights on North Pacific routes with 777 equipment. That's up from 36 in 2002. "Today smaller airplanes can fly longer-range markets. This has opened new markets in a region traditionally dominated by the 747," Baseler said, noting that the average airplane size in the North Pacific has decreased since 1998. Airbus of late has backed off its pure A380 solution, citing instances such as Singapore Airlines' flight from Singapore to Los Angeles aboard a smaller A340-500 and Cathay Pacific Airways' offer of "cutting-edge" long-haul routes introducing the smaller A340-600 between destinations such as Hong Kong and New York. "Airbus can claim the Hong Kong-to-New York route is news, but the fact is Continental has been flying Boeing equipment on this route since early 2001," Baseler said. "The 777 has twice as many trans-Pacific frequencies as the A340. It is obvious Airbus is now refashioning its story from a pure big airplane solution to a more point-to-point solution. They're following our lead." Which is why Boeing is betting on its smaller, highly efficient 7E7, while Airbus bets on its megatransport and a future premised on funneling long-haul fliers through major air hubs. Over the next 20 years, the 7E7 will enable the introduction of nonstop service between more than 450 city-pairs not serviced with nonstop flights today, Baseler said. Airbus wagers differently. It forecasts the need for 1,138 airplanes larger than the 747 over the next 20 years. More specifically, it predicts a need for 168 A380-size airplanes for the top 10 markets. Questions Boeing's Baseler: "So where will the other 970 airplanes operate?" Boeing's forecast for the top 10 markets calls for about half as many of the very large airplanes. "Passengers and airlines want the comfort and frequencies of airplanes like the 777 and 7E7, not the promise of duty-free shops, workout rooms and waiting in crowded airports for connecting flights," Baseler said. Finally, Airbus argues that even if airline customers don't want the A380, a plane of this magnitude is required to alleviate airport congestion. However, Boeing sees the use of megatransports as increasing the problem. The reason: 40 to 70 percent of the passengers on a supersized airplane will be connecting from other flights. So, to fill a huge airplane, airlines will have to increase the number of smaller, "feeder" airplanes, Baseler said. "That means in most cases larger airplanes end up exacerbating airport congestion."